For the next two consecutive Saturdays, preceding the August 5th release of the concluding installment of Lev Grossman’s Magicians Trilogy, I will be featuring reviews here of the two prior installments of the series: The Magicians & The Magician’s King. Giveaway Details: Below this blurb of text, you’ll be able to follow a link (acessed by clicking relevant, magic-themed image below), which should take you directly to a separate page, where you will be prompted to accomplishing different activities to earn entries for this contest. Contest Ends August 5, 2014!!! Now, click the Harry Potter related GIF image below, to be taken to the Rafflecopter AP, relevant to this contest!! During the modernist phase of literature that dawned in the early twentieth century, the coherence of the ideals of conservative values and virtues of life were being called into question, thus the more orthodox prose of the language around this time was become more readily with even more perplexing notions of reality. Once Einstein formulated and articulated the idea that space and time were not fixed things, but were instead a type of relationship that was more relativistic, meaning the unclear, uncertain relationship between these abstractions of our minds are derived from our own confused thinking. Less dependence was being placed on more authoritarian ideas about society and reality; things were becoming less self-evident to the practitioner of “common knowledge.” For many, the twentieth century erupted with strident, ineradicable creativity, from the likes of noteworthy modernist writers, such as James Joyce, who essentially taxed the reader’s minds with many seemingly incomprehensible ways of writing that further shook the foundations of orthodox thinking. Of course, all of this “bending of reality,” was all anticipated by Lewis Carrol’s Alice in Wonderland, which was the first of its kind to really bend reality, time, and providential reasoning. So, the fantasy genre has always been ripe with people willing to adhere comfortably with the notion of relativity. Except, around the latter half of the modernist period, the Inklings, a fellowship or esoteric group of English speculative fiction writers including JRR Tolkien and CS Lewis, were adverse, in many ways, to this emergent embrace of a world that defied self-evident knowledge, thus becoming a regular old atheistic notion instead. Narnia is brashly conservative, as this series of whimsical tales was meant to revive the more immutable notion of magic, folklore, and all other things that were being misconstrued for more nefarious creative purposes, in many James Joyce type stories. They did not want the fantasy elements to serve as mocking, even farcical representations of character tropes from an earlier phase of literary history, when myths and stories of magic were much more widely accepted. As such, even the modernist ideas of “the world between worlds” that has a certain Einstein vibe to it, in the Narnia prequel, The Magician’s Nephew, still carries a certain conservative sterility, as if the function and mechanics of this world are not really enigmatic, or paradoxical, but easily known and recognized by the characters in that story. How does this rather discursive discussion of the clashing literary periods of “modernism,” and nostalgic medieval fantasy (my term for the Inkling’s brand of speculative fiction)? 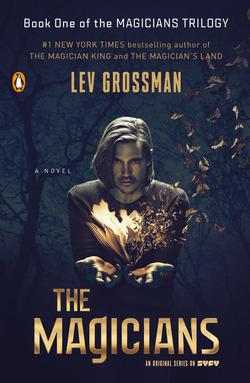 Well, Lev Grossman’s The Magicians can be both better understood and appreciated, if it is recognized as a book that somehow coexists in these two polarized streams of literary thought, and in that way, The Magicians is very much a post-modern novel, as it is really a pastiche of elements from different literary genres. The tale begins deceptively as a classic hero journey, in a sense, where a seemingly “normal,” male character, who is unbelievably smart and precocious, discovers a portal into a separate universe, which is the coexistent dimension where magic logically exists, as a very real concept. Except of course, this tale seems to accept these things with a blind, undeterred faith, only until Quentin, our main hero, starts to really question things more, especially as he makes complex friendships with other rather eccentric magic geniuses of this world. Strangely enough, the mystique of the magic gets demystified, throughout the course of the story, as Quentin ages and the whimsical quality of magic becomes almost muddled, and Quentin starts to lose the idyllic charm of a new sense of the world. At this part of the story, it is really one part fantasy, one part philosophical in its existential extrapolations of thoughts, but it is mainly a psychological narrative of a very unique coming-of-age story, which deals with sexual identity, the meaning of your mysterious relationship with the universe, and relationships between others. Furthermore, the novel does a very good job, calling certain facets of the Inkling tales into question, particularly CS Lewis’ Narnia series. Various elements from that series, recognized easily by Narnia fans like myself, appear subtly throughout various sections of the book, and are somewhat satirized in a very clever fashion by Lev Grossman. When the story delves deeply into the existential layer of the story, while also dealing with the implications raised by the logical existence of certain older, more traditional fantasy tropes, the story really, really succeeds with offering a very interesting, revolutionary take on the well-known, formulaic story of the hero, gaining their powers, and the goals of their journey being not just easily attainable, but having very clear connotations for the story’s character. In typical post-modern fashion, these things, again, are called into question, especially since these things are not entirely self-evident, in the same sense they might be in the Narnia series, but serve a much deeper role in a paradoxical, relativistic sense of the universe (this novel deals more with the “multiverse”). Something rather unfortunate, though, happens at this end of this book, which to me almost destroyed the book in one full swoop. That was the insane, almost pathetically stupid battle sequence at the end, that makes a very interesting, fascinating tale become swept into the morass of a slow, interminable battle sequence. Now, some people enjoy this sort of stuff, but I felt it really obstructed the flow of the novel, and it reduced the characters for a very fleeting amount of time to characters, versus the more deeper characters they were before dashing into a silly battle sequence. Also, the book’s evil nemesis is almost too cartoonish for me to take seriously, unless the intention of this whole scene was really ironical, then I must have been viewing it in the right way, meaning seeing it for the inane, purposeless battle scene it was served as a means to inform the reader of just how everything representing classical heroics is reduced to something silly, inoffensive, and nonsensical. So, if this scene was meant to be ironical, then I will give the writer the benefit of the doubt and admit that the scene being a satire of fantasy novels, with their overblown action sequences, might actually be a stroke of genius. Many other elements of this fantasy world in the novel are clearly satirical, so this might make this scene not just make more sense, but contain a bit more calculated intelligent planning behind it. The whole world is really suffused with an absurdist charm, which really proves that this novel is written by a novelist, very well classed in existential thinking, in many ways. Basically, The Magicians is a literary fantasy novel, for people who really have grown cynical of the same overtired tropes, being lazily employed in fantasy novels, with the same stupid ponderous scenes of uninteresting exposition, the hackney, mythologized characters, the ridiculously technical/dull battle sequences, etc. There are many things to admire about the fantasy genre, but there can be so many things that pose as very frustrating elements, preventing anyone from fully embracing a book. I loved the prose, which was not just layered, but Lev Grossman uses adjective, and adverbs very wisely, and he definitely goes more for the whole “show,don’t tell thing,” versus the more negative opposite way (the tactic that uses more exposition versus techniques of smooth storytelling). Neil Gaiman fans would probably really enjoy this, or even Terry Prachett fans, as this book is more in that class of eccentric, British fantasy, as The Magicians possesses a very Gormenghast sense of humor. Yes, this book is definitely geared for those, who consider themselves fans of Gormenghast!! So, if you like your fantasy novels to be more degrees of sly cleverness versus battle-scene bombast; this is really the fantasy book for you!! Now, if you’ll excuse me, I must be getting on to reading The Magician’s King. Crossing my fingers and hoping to win!!! Good luck!! If you can, be sure to share this with others! Then again, the less people entering, the higher the chance for you to win a copy of this really good novel. Be sure to read my review of “The Magician’s Land” tomorrow, which will be spoiler free. Thanks Barbara for entering this contest!